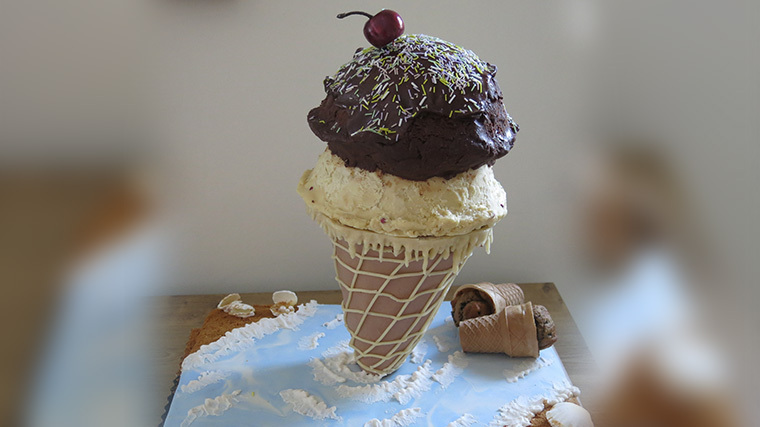 A very talented cake designer and poster on a site that I frequent came up with what seemed to be an ingenious and perhaps even revolutionary idea in the world of cakes. 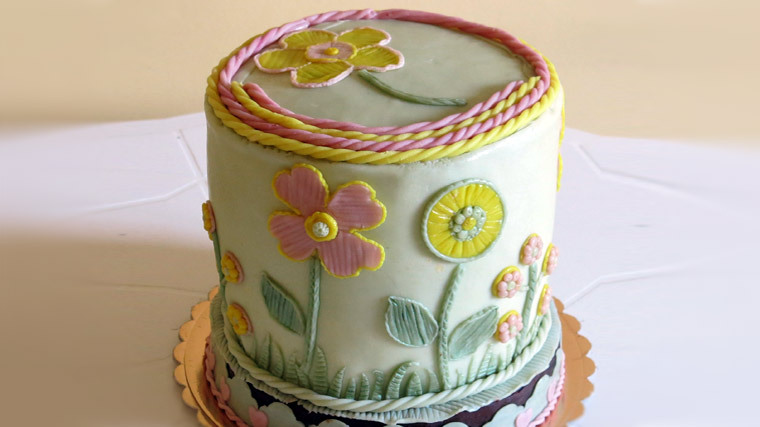 The premise was that many people really don’t care for cake and would much prefer to eat cookies, but they do want and like to have the show of a nicely decorated cake. Robert came up with the idea of making a non cake. 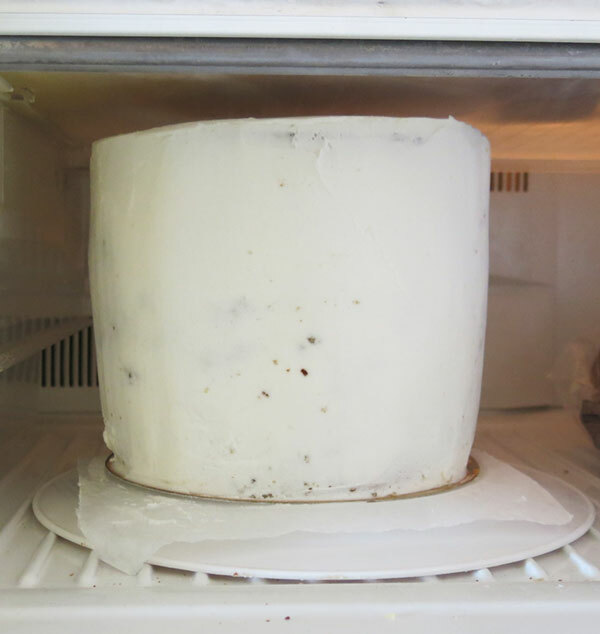 He built a cylinder shape out of rice krispy treats, filled the cylinder with home made cookies and then proceeded to decorate the sealed cylinder as if it were a proper cake. His idea and presentation intrigued me because the non cake was truly beautiful and there was no hint that cookies were hidden inside. I immediately complimented Robert and even mentioned that I might borrow the idea. Well, perhaps “borrow” isn’t the right term. I already knew exactly the occasion that would be perfect its implementation. 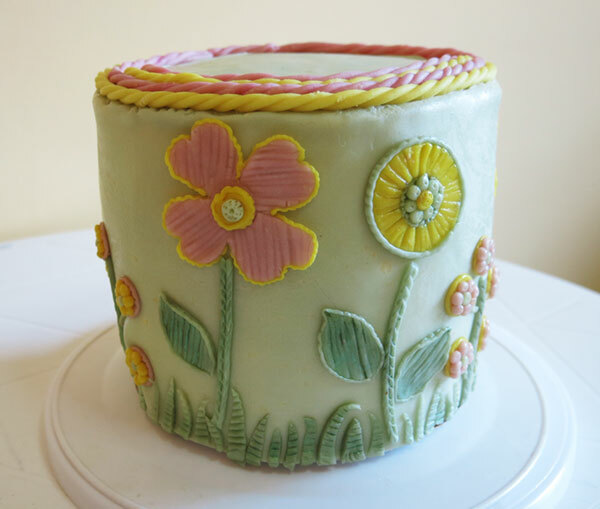 The birth of my first grandchild a week ago sent me searching for ideas for her very first cake. 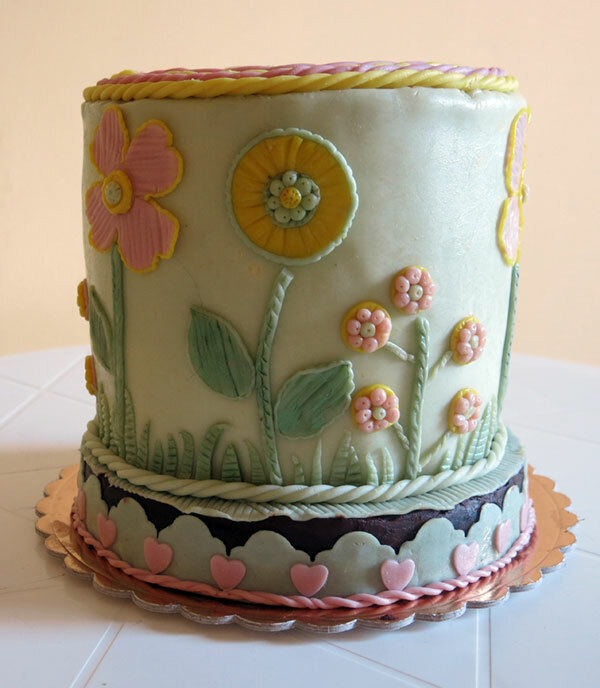 Obviously this would be a cake that she would neither taste nor smear with her little fingers onto a pretty pink party dress, but it should be something that she could look back upon as she grows older, the cake that her grandma made in honor of her birth. So I needed something that would be pretty for her to look back upon nostalgically, but also something that her parents and other guests who would come to visit could enjoy. Problem number one: Her dad, my son, loves my very rich dark chocolate cake, but her mom doesn’t like chocolate and isn’t too keen on cakes at all. Problem number two: People would be coming in to visit on and off and not all at the same time. 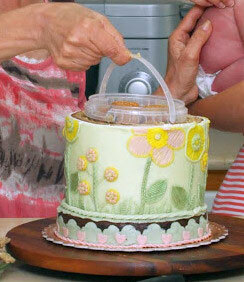 It doesn’t look very courteous to offer four day old cake that’s been cut into several times. Robert’s non cake seemed to be the perfect solution. 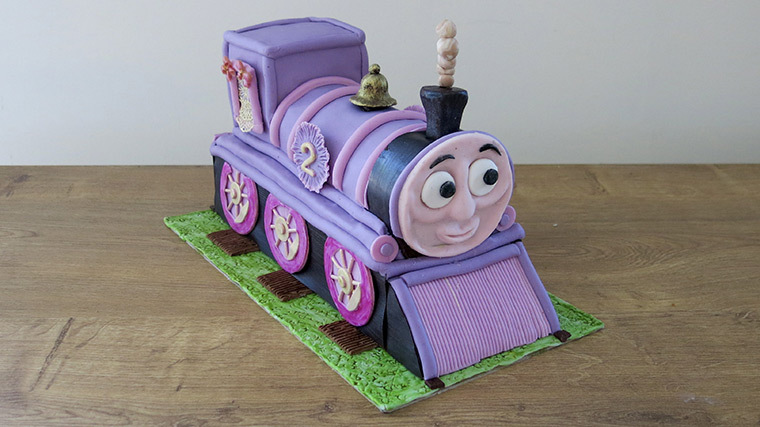 He never did respond to my mention that I might copy the idea and he did put it up with an explanation on a public site, so as the saying goes, I decided to flatter by trying to copy – not the design of his non cake, just the idea. I did realize that I would be taking advantage of his thoughts, concentration and the valuable time that he possibly spent on repeated trials and errors. At the same time, though, I would be saving myself the anguish, the waste of raw materials that might not pan out as well as hours of doing and redoing. My dream of a short cut was quite short lived. I started off by making rice krispy treats, something that I had never previously attempted, and probably something that I never will again. I made the treats using the cereal with ganache as the sticky element since the baby’s mom doesn’t eat marshmallows, the more common ingredient. It was a totally unforgettable sticky and messy experience that never set up, not on the counter and not in the fridge. And in addition it looked quite gross. I have no photos to share my failed venture and I’m fairly confident that you’re grateful. I dumped the whole half kilo into the bin quite unsure of what I would do next. My mini oatmeal cookies were already baked, cooled and stored in a food safe plastic cylinder shaped container waiting for a non cake to sit in. And then it hit me. 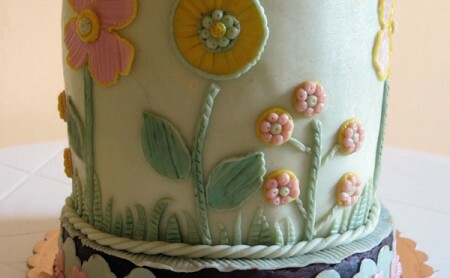 It didn’t have to be a non cake. 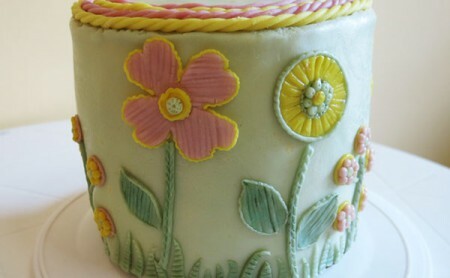 It could be a real cake that was scooped out to have the shape of a cylinder! Robert had his cookies sitting directly inside of his RKT structure, but I wanted mine to be in some sort of vessel to protect them from the possibility of too much moisture. And here they were. They were already sitting on my counter inside the perfect utensil! 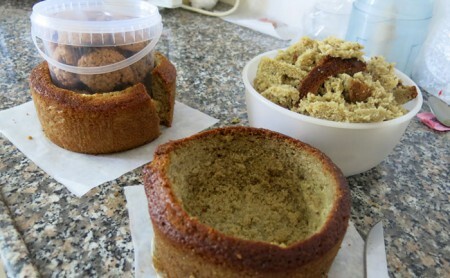 I proceeded to bake 2 relatively tall six inch cakes. After cooling and leveling, I scooped out the inside leaving fairly thick sides that would be wide enough for my container of cookies to fit into. 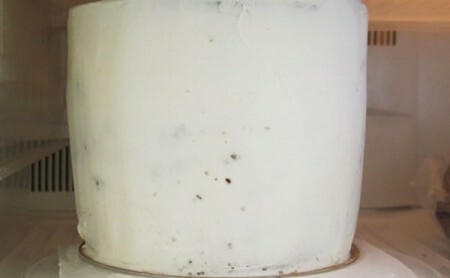 The sides, predictably, cracked as I inserted the container, but that was easily fixed with several thick spoonfuls of spackle consisting of butter cream and the scooped out cake. 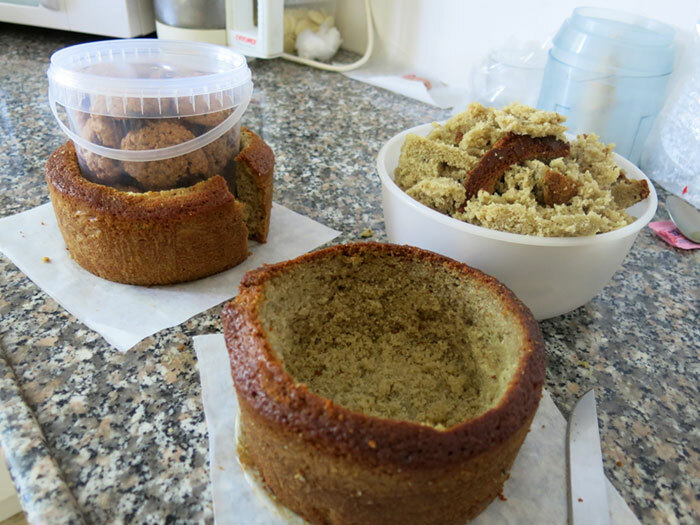 I placed the second scooped out cake upside down on top of the first and there, too, used the spackle to fill the spaces where the cakes didn’t quite meet. 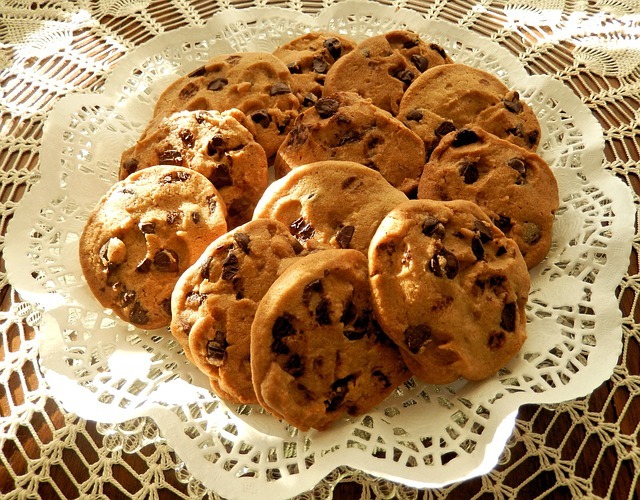 Would you have guessed that there was a container of cookies inside? My thanks to Robert for the original concept.